"It feels like we’re a bit of an annoyance because we’re not where the money is…"
"Needless, unreasonable, disproportionate, and politically motivated." That's how Under-Secretary of State for Transport Paul Maynard described the strikes across UK railways this month. We spoke to the drivers themselves to hear their take...needless to say, they don't quite see eye to eye with Paul. 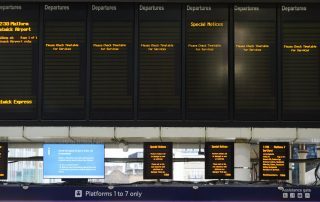 A bit of background – the strikes were called by ASLEF, the train drivers union, and RMT, the guards' union, for two main reasons: Opposition against 'Driver Only Operation' trains (where the driver, instead of the guard, has to check that doors are clear before closing); and the replacement of guards' roles by 'On Board Supervisors'. Economy spoke to drivers along the Southern Coast about why they're striking. Here are excerpts, condensed and edited, from our interviews. ** Note: At the time of writing, ASLEF suspended its industrial action, pending oingoing talks between ASLEF and Southern beginning on the 18th of January, 2017. Charlie – South Coast. 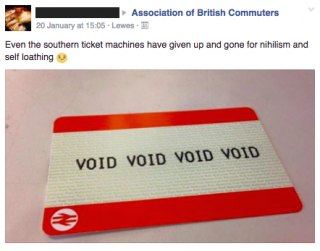 At Southern Rail for 15 years. "I want to make it very clear that I am here in support of Southern. I’ve worked here for 17 years [two years in a previous role, and 15 as a driver] and it’s only very recently that it’s gone downhill. It’s probably because of the way the franchise is structured – it’s a private franchise but run by the Department for Transport. It’s just a different working atmosphere, really. You can come in for your shift and there’s another hour off the back of [what you agreed]. You have to stay for it, and that causes childcare issues because my wife works. You can’t plan your life. It’s been a while since I felt valued by the company. It feels like we’re a bit of an annoyance because we’re not where the money is… Thameslink is another company...that has great new cameras, high def, all-singing-all-dancing. We don’t have that kind of equipment. The head of our safety department won’t have our equipment fixed because ultimately the Department for Transport are the paymasters, and if they tell him to dance he’s gonna put on his tap dancing shoes. Some people have suggested that strikes like this on public transport should be banned because of the effect they have on the public. But in situations like this if we’re not looking after the public’s safety, then who is? If we don’t have the right to educate the public – well you could hoodwink the public and bring in unsafe working practices and no one could do anything about it. We’re not getting the exposure we should be getting for people to take notice and realise why we’re striking. 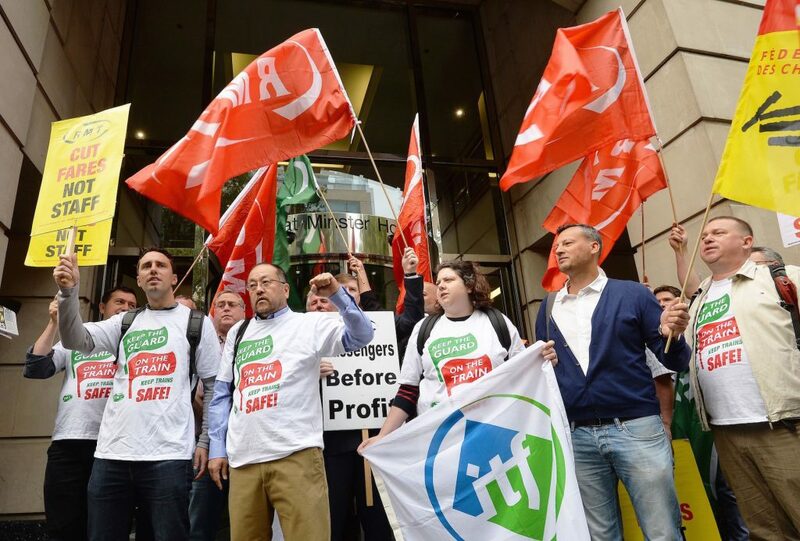 There’s the Association of British Commuters who are really good, they know what they’re talking about, but when it comes to the papers, most of them are extremely anti-trade union. 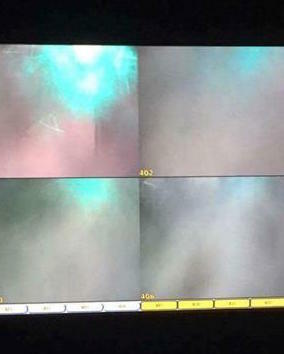 There’s reams and reams of those images showing the bad camera images out there, but the only time you’ll ever see them is on social media. You won’t see them printed in a newspaper." Peter – South Coast. 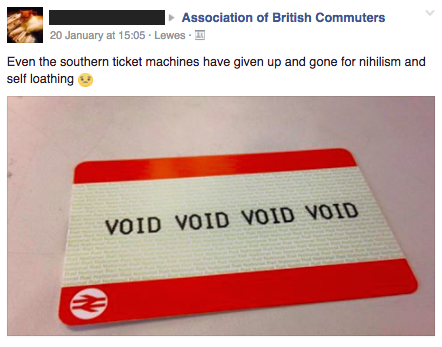 With Southern Rail for 17 years. “I think people forget train drivers are human sometimes. We get tired like everyone else. For that minute when I’m at the station, I often have a cup of tea or walk around the cab to maintain concentration. That could lead to ‘safety on the line’ incidents...there’s software available to the industry, but we have what’s called the human element. There’s a fix for it, but it costs a bit of money. It’s down to the individual to manage their fatigue, but the fatigue has changed since the mode of working has changed. You’re meant to have 32 hours off between Saturday and Monday, but that’s ‘subject to the needs of the business.’ 9 times out of 10 it is reduced to finishing at 2am on the Saturday and starting at 3am or 4am on Monday, and you’re supposed to get two sleeps in in that sort of time. I get that everyone want to see an end to all of this – we do too, we’re losing money hand over fist, especially after Christmas – we’ve still got children that we need to feed, clothe, send to school. But you can’t put a price on safety. This profession is extremely well paid, and it’s extremely well paid for a reason. We could have quite easily sold DOO for a 10% plus pay rise, but we haven’t because it’s not safe. We said no, we’re not about selling safety for money. It isn’t money driven, it isn’t political, it isn’t ‘we’ll help our mates on the RMT [the guards’ union]', it’s about customer safety, it’s about us doing the right thing through the adversity of being told we’re doing the wrong thing. They’re ultimately playing Russian roulette with people’s lives and your career. Dave – location undisclosed. With Southern Rail for 10 years. "What you've got to understand about the railway is that it runs on goodwill - you scratch my back, I'll scratch yours. That’s all changed. You know, when you get into work and your guard's sitting in the mess room crying, because they've taken away her family’s travel pass, because the guards have been striking - everyone on the railway considers the pass as part of their pay, her kids need it to get to school – it’s the worst feeling. They say that you can never leave the railway - once you're here for six months you're here forever because you never want to leave. We all thought of this as a job for life. Now we can’t leave, because what else can we do? No one else will take us, not at this age on this pay. You know the worst thing? It’s having to drive off seeing a disabled person stranded on the platform because there's no one there to get them on the train. You want to do it but you can’t because we've been told not to. You just have to watch them as you drive off. It breaks your heart. What they don't realise is that it takes so long to train to become a driver for a reason. Not anyone can do it, you have to pass tests to prove your concentration levels, your reaction times, your memory and your reasoning, You also need to learn how to fix the train and get it up and running again if something goes wrong. There’s a lot of classroom learning and then 240 hours of driving with an instructor. It takes 12-15 months. You really need to be able to concentrate – people’s lives are on the line. The thing is that Southern don't lose any money with these strikes. It’s a management contract, so they get paid a certain amount to manage the service on behalf of the government whether trains run or not. The government gets any profits, but also bears the losses when trains are delayed or cancelled, which is all the time. What kind of arrangement is that? 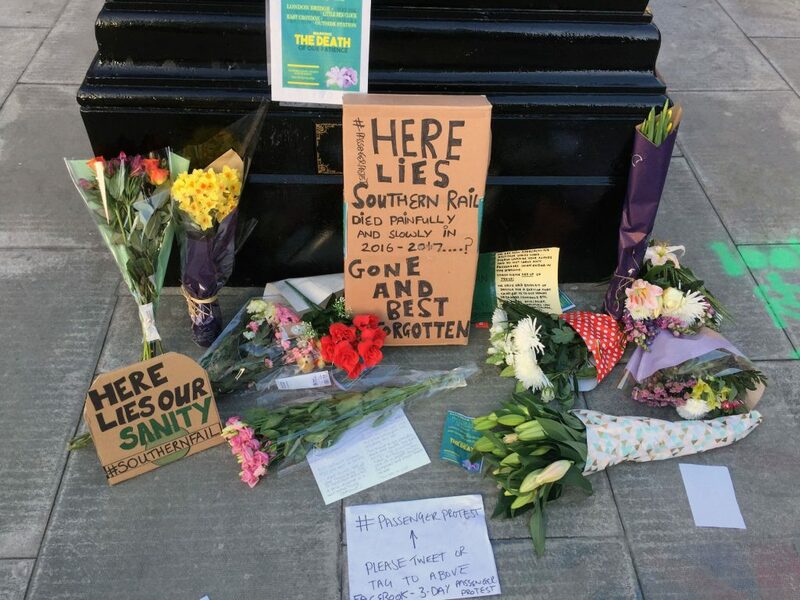 Technically, Southern is a business, but it doesn't work like a normal business because it can make decisions that under normal circumstances would mean it loses money, but it doesn't." Alan – location undisclosed. 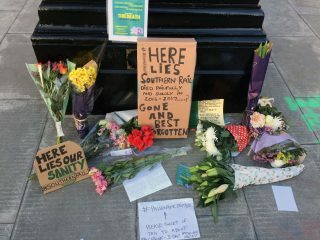 With Southern Rail for 22 years. "A lot of our passengers have been commuting on our trains for twenty odd years, so they've seen the changes over that time, with more and more people crammed in and having to sit on the floor. They pay so much, sometimes four or five thousand pounds a year – they don't deserve that kind of treatment. And the way disabled people are being treated is like Victorian times. The ideal railway would be affordable and accessible for everyone and right now we don't have that at all. Then they're saying they're recruiting new drivers, without anyone to train them! It’s such a waste. I think they're doing this advertising campaign of the new jobs to make the public annoyed about the amount we earn for the four day week that's never a four day week. The government are making this a fight and we're the toughest nut to crack. We're the biggest company. Once you've got us it’d be a domino effect to crack everyone else. What they’re doing is a cost-benefit analysis, you see."